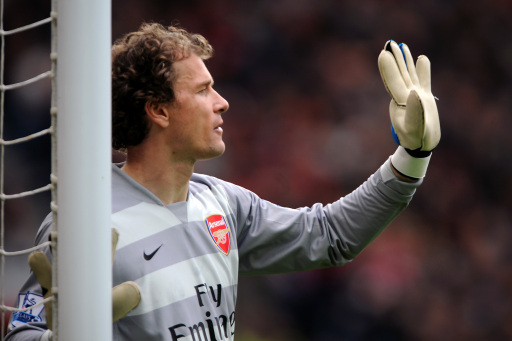 According to none other than Arsene Wenger himself, Jens Lehmann has agreed but not yet signed a contract that will see him rejoin Arsenal until the end of the season to provide cover for the club’s current ‘keeper deficit. Manuel Almunia must be overjoyed. Wenger also confirmed that Thomas Vermaelen will definitely not play again this season after a suffering a sixth relapse in his bid to recover from a long-standing Achilles problem, that Johan Djourou is likely to miss ‘at least the next six weeks ‘ (there are only nine weeks left of the season) after dislocating his shoulder against Manchester United and that Cesc Fabregas, Theo Walcott and Alex Song will all miss the Gunners’ trip to West Brom this weekend. Is Arsenal’s ‘last-chance saloon’ title bid literally starting to fall apart at the seams? Well at least we’ll have some crazy Lens to assuage the massive !fail. God it’s come to this! Why didn’t Wenger just get Given or Schartzer when he had the chance. Stubborn old man.